This page introduces various sensing equipment using the high precision capacitance technologies. We cope with difficult applications that have been difficult to measure with conventional sensors. If you are saying, We need a level sensor that can measure in our specific conditions, then count on us. We can provide devices that will meet any need, including the following. 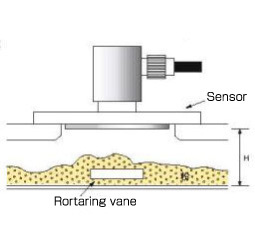 We install high-sensitivity capacitance level meters to measure the thickness of the bubble layer that is caused by chemical reactions in a production line. The level meter can measure the bubble level continuously, not just from time to time. Sensors already existed that could measure liquid levels in insulated glass tubes at a specified time. 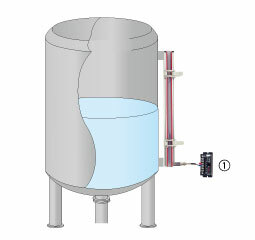 Our innovation is a level sensor that can measure liquid levels continuously, without contact. This level meter can measure the level of powder in a sealed container in harsh conditions involving a lot of flying powder and dust. See the example case below. We managed to control the powder level using a capacitance level meter on the machine that dispensed the powder into a table type sealed container. We solved this problem by design and produced special flat electrode as shown in figure 2, and measured change of capacitance without contact material. 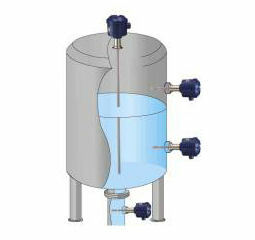 Use this level meter to measure continuously the liquid level in a small tank or in a limited space. This level meter is compact, easy to wash, and can be used in harsh environments. Below describes an application example. 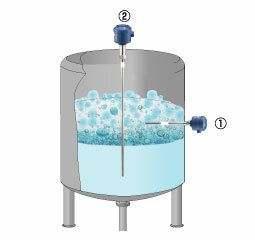 Measure levels of cleaning liquids, liquid chemicals, and pure water, and improve the yield rates. Measure levels of liquefied gases (liquefied nitrogen, natural gas LNG) in low temperature environments. Continuously measure levels of lubrication oil in systems and equipment, and engine oil. We do not use just the standard amplifiers. We can provide a variety of capacitance sensor amplifiers, including highly sensitive ones, to meet various requirements. 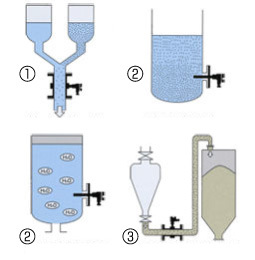 We have devices to deal with the following applications, beyond the simple measurement of material levels.